New Yorkers mark invasion of Afghanistan | Fight Back! 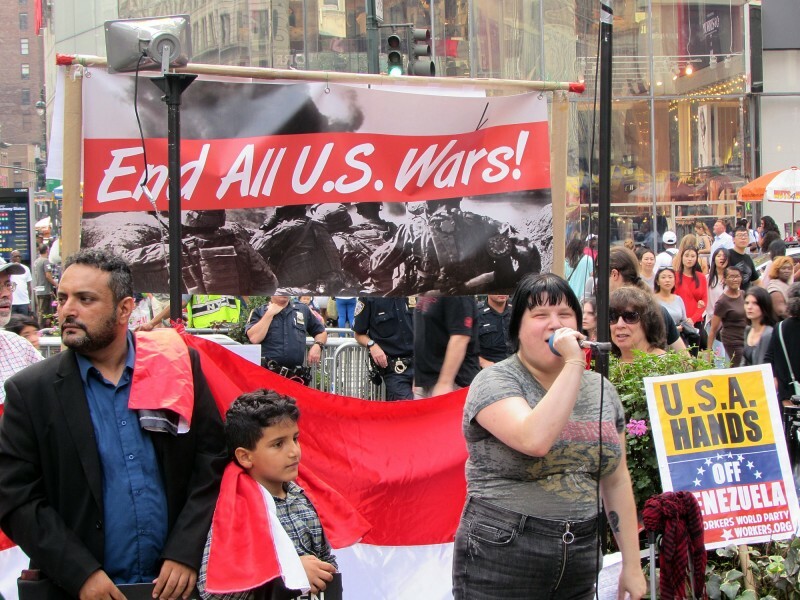 New York, NY – Several dozen protesters gathered in Herald Square on October 7 to mark the invasion of Afghanistan and protest the other wars the U.S. waging abroad. The war on Afghanistan has lasted 17 years. Spirited protesters rallied and listened to speeches about the damage caused by U.S. imperialism throughout the globe. A large group from the Yemeni American Organization attended. Their speakers highlighted the plight of Yemen, which is currently being attacked by the United States, Saudi Arabia and others. In between chants of “Out of Afghanistan! Out of Iraq! Out of Syria, don’t come back!” and “U.S. imperialist! Number one terrorist!” organizers handed out flyers that detailed the casualties since 2001 and that the U.S. expended $5.6 trillion on war in 17 years. Bernadette Ellorin, representing the International League of Peoples’ Struggle, spoke about fighting back against imperialism and how it’s vital to stay organized. The protesters then marched to the Army Recruiting Station in Times Square. The event ended with a few more speeches as onlookers learned about the U.S. brutal war machine.